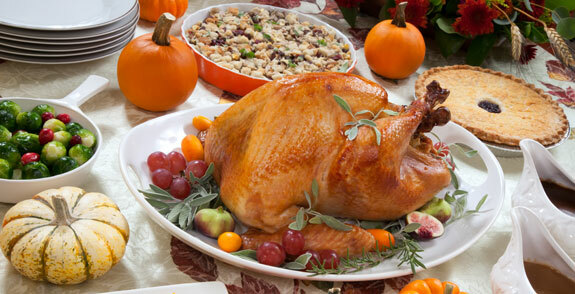 According to the U.S. Fire Administration, more than 4,000 fire happen each Thanksgiving Day, usually in the kitchen! Keep knives out of children reach. Ensure that children, pot holders and food wrappers are a at safe distance— at least 3 feet!—from warmed surfaces (i.e. the stove). Position those handles so that they face inward. Have activities that keep children out of the kitchen while the meal is being prepared. Avoid dangling accessories, cords or loose clothes around kitchen fires, or within children reach. Maintain good housekeeping: keep floors clear so you don’t trip on children, toys, bags or pocketbooks. Keep matches and lighters out of children reach. Keep a fire extinguisher handy in the kitchen, outside by the fryer and know how to use it. Better safe than sorry. You can call the pros at 1888-674-6854 (USDA Meat and Poultry Hotline) with any cooking questions! Unplug appliances that are small and unnecessary; it’s a smart way to save energy and eliminate potential dangers if something is accidentally turned on. After the party, walk around the home and ensure candles and fireplaces are extinguished, unnecessary appliances are turned off, and no potential hazards (leftovers, sharp/flammable objects) are in reach of your kids or pets. Click here to view a Thanksgiving fire safety tip video from NFPA. You can obtain additional information by logging onto Atlantic Training or NFPA.